Dihydrogen monoxide is used in pesticides, as a solvent in industry settings and a coolant in nuclear power plants, but you consume it every day. That’s because it’s just water. Di-hydrogen mon-oxide: H2O. Chemicals tend to have pretty scary-looking names, but they’re all around us, all the time. 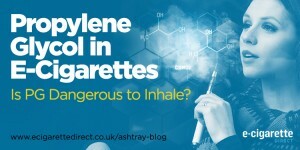 “Propylene glycol” sounds almost alien the first time … Continue reading Propylene Glycol in E-Cigarettes – Is PG Dangerous to Inhale?